I have been waiting so long for this lovely book. Several years ago I made the decision to only grow fragrant plants in my garden, and I am surprised to find the variety that I can play with. I want to share this my friends on Facebook. I’ve been waiting on this book for almost 6 years, I can’t believe it’s finally time!! So exciting! I’ve never tried making perfume from the flowers in my fragrant backyard garden, but now I will learn how! Found it on facebook through a friend share, also shared on facebook! I cannot wait for this book! Every perfume maker will need to get this book for sure. Very excited about the organic perfume book. Just finished a fun workshop with Women’s Heritage in Carpinteria, CA making tinctures and salves, and learning about hydrosols (their blog: womensheritage.com). Would love to see a non-profit created for flowers, using the same concept as “Veggie Rescue” in Solvang, CA (https://www.veggierescue.org), where excess produce from farms is collected and delivered at no cost to recipients. For flowers that are starting to wilt or excess in abundance, the same efforts could be done, making perfumery more sustainable. I will forward the blog to my friends and relatives via email, as I don’t use facebook, Instagram, etc. currently. Looks like a really great book. I’m sharing this with my friends on FB, hopefully I will win it! I so look forward to working with the tropical flowers in your new book, Anya. Facebook also received my comment. Thank you for the offer! SO enamored with alll things perfume, but Homemade perfumes are all LOVE! So excited, can’t wait! Sharing the love on social media as I type! What an awesome resource, the result of years of experience! I can hardly wait to receive my copy once it is released so I can expand my current repertoire of techniques and products. The book sounds amazing! Can’t wait to read it. Also shared on Facebook! Very excited to get a great reference ! Thanks for the Giveaway ! Shared every where ! I can’t wait to have this book for my own! I remember trying enfleurage when I was a teenager. It was not a success! I shared your post on Facebook. I can’t wait to read this, and am hoping to win the free copy. I’ve been a fan for years, and my fondest dream is still to study with you some day. Thanks for the many years of great contributions, community, and absolutely amazing skill and mastery. Preordered in February I think. The wilting blossoms shown above look remind me so much of one of my favorite flowers in Mom’s garden gone so long ago -multi colors of phlox with their sweet nectar. Waiting for the book so much and my perfumers friends from Ukraine! I cannot wait to read your book. I am passionate about tincturing and infusing plant materials and would like to learn more about how to integrate them in perfumery. I shared your blog post on Pinterest. I’ve been enjoying Anya’s work for years. I can’t wait until this is released!!! Shared on Facebook, Instagram, and Pinterest, and Twitter. What a wonderful and comprehensive sounding book on the topic of perfume. I look forward to reading it! I can’t wait to get your new book, and get my own perfume garden going! Thank you for writing it! I am so excited!! I am a perfume maker and would love to learn more! Congrats on your continued success!! I’m so excited to read this book! Can’t wait until it comes out! I am so excited about Anya’s NEW book! I received a Certificate from Anya, and her course is amazing, as well as the Natural Perfumery Book, that I used to study with her, as well as use as a daily reference book to my perfume making!!!! This new book will probably be just as good and Anya has a way of explaining how to do things so the lay person can fully understand! She is thorough and knowledgable. Please order your book today!!!! I will soon too! Thank you, Anya, for your passion and commitment. You and what you accomplish are inspiring! Congratulations on, what looks like will be, a real resource, Not just another redo. Fragrant Blessings to you! Can’t wait to read this book. I have been waiting to find this information ! I do my own perfumes from essential oils and absolutes and I feel ready to move onto extracting my own essences. Particularly because my jasmine is starting to flower ! Thanks Anaya ! Can’t wait to review this for our clients! I’ve already preordered the book, and can’t wait to read it! Congratulations, and so many thanks for all your inspiring work. Thank you Anya about all your efforts made in this field of perfumery. I’m looking forward to your book, Anya. I have made some products in the past from wild flowers and those in my garden, and would like to get back to doing more of this. This looks like an amazing book to have! I have always wanted to learn how to make my own perfumes! My father instilled a love of fragrance in me as a child. I have been interested in the old fashioned way of perfumery because of him. Your book looks outstanding to assist my goals! I NEED this in my collection!! Anya, I pre-ordered your book as soon as it was made available. I’ve enjoyed your input, information, and insights for over a decade now and am really looking forward to all the new things your book will bring. I’d love a copy to give to my sister-in-law who loves gardening at her mountain home in southwestern Oregon. Here in the mountain foothills of far northern California we have very hot, dry summers and cool-to-chilly, sometimes wet winters. I hope to find some good suggestions or clues as to what plants might be worth the effort in this non-tropical climate! What a fabulous reference. Can’t wait to add it to my collection. Thank you for your dedication to the natural perfumery world. I shared on Facebook. Thank you. How fantastic. My ideal way of life in a book. I am so excited about this new book, and know it will be one of those constant companion books, well worn with all manner of my attempts at perfumery feeding back at me off the pages in years to come. I’d love to win, but I’m going be eager to get this book in any way I can! Way back when you first started talking about your book I expressed an interest in it and thought that I had pre ordered then. I imagine that I should pre order again. I am so excited to know how to obtain the fragrance from my star shooter lilies. Each year I have close to a hundred blossoms that are about 5 inches or more across. They are so fragrant I am so excited to have your book to help me save their beautiful fragrance. I will definitely pre order your book. hello anya, my preorder has been submitted. felicidades. This is a new interest for me. I look forward to reading this!! I can’t wait for this book! 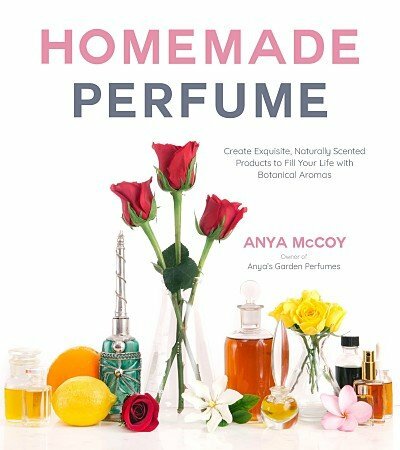 I’m enrolled in Anya’s online perfumery class, and Homemade Perfume will be a great augmentation! We have so many great fragrant plants in central Texas that are not on the market, and this book will possibly help bring those fragrances to the rest of the world! Wow, whoa , and whammytwinkles ! I am so grateful for whoever guided me to you tonight ! Omy goodness – what an honor that would be . I’m very excited for this book! I can’t wait until it’s released! The winners are: Laurie, Fay H., Sonya, Crystal, and Amanda. I tried your enfleurage technique and love the powder created with jasmine flowers. I can’t wait to see what other goodies are in your book.